March madness: Spring doesn't start until next week, but there's already a summer heat wave at the boxoffice. With "Logan" grossing $152.7 million in 10 days, "Kong: Skull Island" opening last weekend to a much better than expected $61 million and Hollywood handicappers speculating that "Beauty and the Beast" could kick off Mar. 17 to as much as $150 million, it's clear that March madness has hit the multiplexes. It's a welcome change from January's icy ticket sales and from February's partial thaw. There were slim pickings in January for everyone but horror thriller fans. They turned the heat up on writer-director M. Night Shamalayan's career by flocking to "Split," which has done $135.8 million domestically through last weekend. There were warmer temps at the February boxoffice, which got off on the right foot with the family friendly animated "The LEGO Batman Movie" ($159 million to date) and the strictly adult romantic drama "Fifty Shades Darker" ($112.9 million to date). February ended on a happy note with the surprise low budget horror comedy "Get Out" ($111.1 million to date). The multiplexes have been humming every week this month. Warner Bros. and Legendary Entertainment's "Kong" debuted in first place last weekend to $61 million, way stronger than the low $50 millions range opening that Hollywood handicappers had been anticipating. Its success reflects the view movie marketers often express that if you give moviegoers what they want to see, they'll go see it. That's why big budget special effects action adventures about familiar superheroes or master villains typically translate into big boxoffice bucks. "Kong" reportedly cost $185 million to produce and audiences have high awareness of the iconic Hollywood ape. And if you release such films at a time of the year when the marketplace isn't crowded with top tier product – the way it is in the summer -- the likelihood of boxoffice success is all the greater. It also helps to be playing on 3D and IMAX screens, where moviegoers can get the most out of the big screen visual experience. IMAX said Sunday that "Kong" did "$12.4m globally from 674 IMAX screens in 63 markets. It's the 2nd highest grossing Global March opening ever in IMAX without China....KONG delivers a strong and better than expected $7.6m in North American box office from 382 IMAX screens, where 8 of the Top 10 grossing locations included an IMAX auditorium. "Internationally, KONG is the 4th highest grossing March IMAX opening ever and the 2nd highest without China. KONG opens in China on March 24." In its Sunday morning boxoffice report, comScore noted that, "Warner Bros. reports: KONG: SKULL ISLAND stomped into the international marketplace at a gorilla-sized #1, grossing an outstanding $81.6m this weekend on 20,400 screens in 65 markets!" That adds up to a global first weekend gross of $142.6 million. Directed by Jordan Vogt-Roberts ("The Kings of Summer"), "Kong" stars Tom Hiddleston, Samuel L. Jackson, John Goodman, Brie Larson, Jing Tian and Toby Kebbell. In "Kong," an explorer team reaches an uncharted Pacific island and unknowingly enters the legendary monster's territory. The PG-13 rated 3D fantasy action adventure is from the producers of Warner and Legendary's 2014 hit "Godzilla." Opening May 16, 2014 to $93.2 million, "Godzilla" did $200.7 million domestically and over $328 million internationally. The last version of "King Kong" opened Dec. 14, 2005 from Universal and WingNut Films to $50.1 million. It did $218.1 million domestically and $332 million-plus internationally. Over the next four years, WB and Legendary will make the most of their "Kong" and "Godzilla" franchises with new episodes starring those long established super-monsters. The sequel "Godzilla 2" is scheduled to open Mar. 22, 2019 and the franchise mash-up "Godzilla vs. Kong" is to arrive May 29, 2020. Another Hollywood beast with its own phenomenal boxoffice track record will rule the multiplexes this weekend. Walt Disney Pictures and Mandeville Films' PG rated 3D live action/animated fantasy musical "Beauty and the Beast" will dance into about 4,000 theatres. "Beauty" should play best to families and should also do well with adults who fondly remember the 1991 animated original. IMAX said Sunday that "Beauty" will open on 1,028 IMAX screens in 56 markets worldwide. Directed by Bill Condon ("The Twilight Saga: Breaking Dawn" parts one & two), it stars Emma Watson, Dan Stevens, Luke Evans, Kevin Kline and the voices of Josh Gad, Ewan McGregor, Stanley Tucci, Ian McKellen and Emma Thompson. In this new live action version, Prince Adam (Stevens) is trapped within the body of an ugly beast (also Stevens). The only way he can be set free is by finding true love. 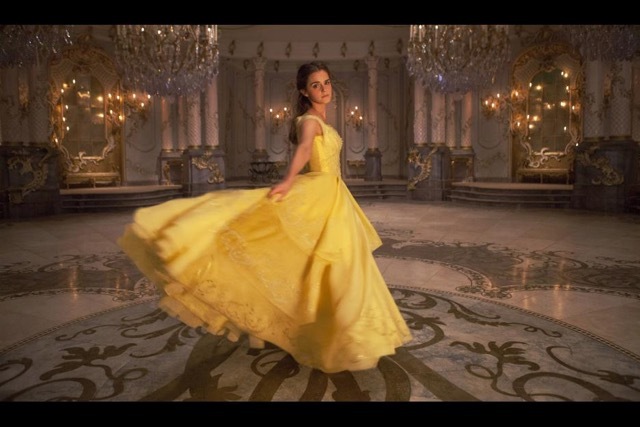 The Prince's best chance for that is Belle (Watson), the first human girl to visit the castle since it was enchanted. The animated "Beauty and the Beast" opened Nov. 15, 1991 to $162,146 at 2 theatres and then went wide Nov. 22, 1991 with $9.6 million. It grossed $219 million domestically and did about $206 million internationally. "Beauty" received six Oscar noms, including Best Picture. There was no best animated feature category at the time, which helped it get into the best picture race. It won for both original score (Alan Menken) and song ("Beauty and the Beast"). The weekend of Mar. 24-26 will see three wide openings competing for moviegoers' time and money. Columbia and Skydance Media's sci-fi horror thriller "Life" is directed by Daniel Espinosa ("Child 44") and stars Rebecca Ferguson, Jake Gyllenhaal and Ryan Reynolds. It should play best to adult men, the core audience for most sci-fi films. It's about a team of scientists aboard the International Space Station for a mission of discovery. Primal fear strikes when they discover a rapidly evolving life form that's extinguished life on Mars and now threatens the crew and all life on Earth. Warner Bros. and Primate Pictures' R rated action crime comedy "CHIPS" is directed by Dax Shepard ("Hit and Run") and stars Michael Peña, Dax Shepard and Jessica McNamee. It should play best to adult men. Shepard plays Jon Baker and Peña plays Frank "Ponch" Poncherello, who have just joined the California Highway Patrol (CHP) in Los Angeles. Baker's a beaten-up former pro motorbiker trying to put his life and marriage back together. Poncherello's an undercover Federal agent investigating a multi-million dollar heist that may be an inside job. Despite their differences, between Baker's unique bike skills and Ponch's street savvy, it might just work out – as long as they don't drive each other crazy first! 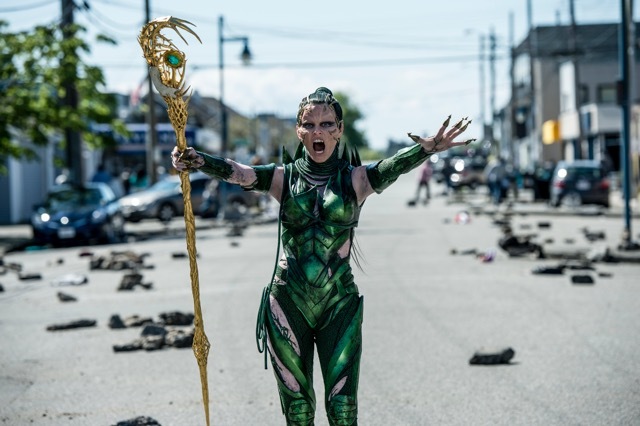 Lionsgate and Saban Entertainment's PG-13 rated sci-fi action adventure "Saban's Power Rangers" is directed by Dean Israelite ("Project Almanac") and stars Becky G., Elizabeth Banks and Bryan Cranston. It should play best to younger men. It's the story of five ordinary teenagers who must team up to stop an alien threat from obliterating the planet. Chosen by destiny, they're the only ones who can save Earth. But to do so, they must overcome their real-life issues and band together as the Power Rangers. March should definitely go out like a lion not a lamb thanks to the Mar. 31 launch of 20th Century Fox and DreamWorks Animation's PG rated 3D animated comedy "The Boss Baby." It should play best to families and may also attract some of Baldwin's "Saturday Night Live" fans. Directed by Hendel Butoy ("The Rescuers Down Under") & Tom McGrath ("Madagascar" and two sequels), it stars the voices of Alec Baldwin, Steve Buscemi and Lisa Kudrow. Baldwin voices a bossy new baby whose sudden arrival turns family life upside down for his wildly imaginative seven year old brother. Mar. 31 will also see the arrival of Paramount and DreamWorks' PG-13 rated 3D sci-fi action crime drama "Ghost in the Shell" from "Snow White and the Huntsman" director Rupert Sanders. Starring are: Scarlett Johansson, Michael Pitt and Rila Fukushima. Johansson plays the Major, a unique special ops human-cyborg hybrid leading Section 9, an elite task force targeting the world's most dangerous criminals and extremists. They're confronting an enemy out to destroy Hanka Robotics' advancements in cyber technology. Bottom line: The winds of March are definitely stirring things up at the boxoffice. Last weekend saw all films in the marketplace gross about $166 million, per comScore – up 23 percent from $135 million this time last year. March has made its mark on the year-to-date, reversing the earlier downward trend. 2017's $2.181 billion boxoffice total thus far, according to comScore, is up marginally by 0.3 percent vs. $2.174 billion this time last year. A week ago, comScore's tracking had 2017 down by 1.9 percent and the week before that it was off by 2.7 percent.